In the twentieth century, every farming village in Brabant had mutual cattle insurance. The cooperative insurance covered the loss of cattle. This so called 'fund' covered not only animals that had died, but also ill or wounded animals that had to be disposed of because treating the animal was either pointless or not financially wise. Around 1960, farms in the province of Noord-Brabant were still mixed and small-scale with two to six dairy cows and a few calves; two or three sows and a few fattening pigs, a few dozen chickens and a vegetable garden. This was the livelihood of families with ten or more children. Back then, the death of a cow meant a huge loss. There were a lot more farmers than there are now and they jointly shared such losses. But the farms expanded and focussed more and more on a single species of animal. In the eighties, dairy farms had an average of forty cows; that number had risen to ninety or a hundred around the year 2015. And so the loss of a single cow carried less and less weight. And there were fewer and fewer farmers left among which to share losses. This meant the beginning of the end of the mutual cattle insurance. Today, in the twenty-first century, farmers only have insurance for calamities, such as losing half the herd to fire. It takes a large company to cover losses of that kind. The fund in Berlicum and Den Dungen served its purpose until the outbreak of foot and mouth disease in 2001. The amount paid out from the fund to the farmer upon losing a cow depended upon the animal’s weight. And so the dead or sick animal had to be weighed before being disposed of. A board member of the fund would then take his tractor to the farm concerned. The weighbridge was positioned at the back of the tractor. It had not been designed by an engineer from the Technical University in Delft, but rather devised and manufactured on a farm in Berlicum. And you can be sure that the measuring result was non-negotiable, the payment was made per kilogram after all. It is evening and I am not on call. Still, I get a call from a farmer who wants me to drop by. This is very unusual. I get underway without asking any questions. The tractor with the weighbridge of the cattle fund is on the premises when I arrive. Just thirty minutes earlier, a cow had been rejected by the colleague on call because it supposedly is suffering from Aujeszky’s disease. The animal was acting strangely: it appeared to be blind, staggering around and pressing its head against the wall of the barn. This kind of aberrant behaviour in cattle is referred to as ‘neurological symptoms’, which may vary greatly. Many illnesses that go hand in hand with neurological symptoms are fatal; mad cow disease and rabies, for example. The same goes for cattle with Aujeszky’s disease, also called ‘pseudorabies’. In the eighties, the Aujeszky-virus was still widespread among pigs in the Netherlands. And this farmer not only had dairy cows, but also porkers that had been infected with this virus. This was already evident from blood tests. It scarcely shows in pigs: they can be a carrier of the virus without becoming ill. The pig shed is located at a good distance from the cow barn. And the work clothing and tools are kept separate. But a virus can be passed on before you know it, with far-reaching consequences. The Aujeszky-virus can penetrate the central nervous system of cows, resulting in neurological symptoms that resemble rabies, which explains the term ‘pseudo-rabies’. And a rabid cow is terrifying. I experienced that first hand. While I was taking the animal’s temperature, it suddenly roared and lunged forward, foaming at the mouth and sinking its teeth into the steel clamp to which it was fastened (an extremely strong clamp, fortunately). The farmer’s wife, who was standing in front of the cow near the door, fled in a panic and did not show herself anymore until the animal had been removed from the premises. 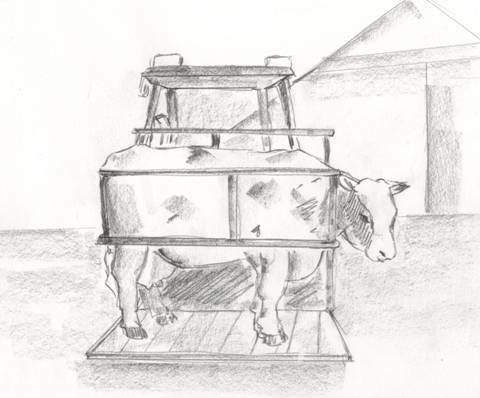 In a later stage, a cow with Aujeszky's disease will become drowsy, and it will eventually die after two or three days. Treating the animal will not change that outcome. The diagnosis can only be determined with certainty by examining the brain and the spine. Meaning after the animal has died. Fortunately, the Aujeszky-virus is not contagious among humans. The genuine rabies virus is. And cows can also become infected with that virus as a result of a bite from a rabid dog or fox when they are at pasture. So you must always observe due care when cows have neurological symptoms. “Good evening everyone.” The farmer and the chairman of the fund are feeling uncomfortable with the situation in hand. This is the first time ever in this practice that someone has requested a ‘second opinion’. And so there must be some urgent reason. We go to the former horse stable. Insides lies a meagre cow with sunken flanks. She is no longer eating and ‘the milk is out from under.’ In the stable, the animal acted strangely and appeared to be blind; and it drifted about on the way here. Now, she is listless. Her hind legs are somewhat swollen, because the animal has sole ulcers under its lateral claws. Despite her dazed state, I remain on my guard. She does not have a fever, heart and lungs are normal, but the paunch is motionless. The udder is slack. An internal examination shows her not to be with young and the belly contains only a small amount of feed, the intestines are empty. I use a catheter to draw off some urine. The test strip immediately turns bright purple: so the urine contains a high concentration of ketones. These are the products of the degradation of fats. One of these is acetone, a substance that easily evaporates and that has a characteristic smell. If an animal loses weight, its body fat is used as a source of energy and ketones are released into the bloodstream. These ketones are not only discharged via urine, they also end up in the milk and they are exhaled. Many people cannot smell this, but there are a few whose nose is very sensitive to the substance: they recognize the smell from metres away and they can walk among 40 cows and point out which one smells of acetone. Such cows are suffering from acetonaemia, a disorder that is referred to as ‘ketosis’. If the concentration of ketones (acetone) in the blood becomes high, the brain is stimulated, possibly resulting in neurological symptoms. The chairman of the fund has a nose that is sensitive to acetone and he came this evening to weigh the cow. He had noticed the smell of acetone during the weighing procedure. “That cow does not have Aujeszky, but ketosis” he told the owner. And that is a disorder that can be treated successfully. So perhaps this cow can heal after all and will not need to be compensated for using means from the fund. The burning of the animal’s own fats must cease and the cow must start to eat again. She is given a drip with a sugar solution in the milk vein as a direct energy supply and an injection with a preparation of cortisone that will mobilise the cow’s remaining energy reserves. Corn and tasteful hay is set in front of her and she is given a ‘gorging shot’: a substance that stimulates the brain to induce eating. Finally, I leave behind two bottles containing propylene glycol for the follow-up treatment. It will be administered to the animal orally in the days to come. It has the same effect on ruminants that dextrose has on people: a quick supply of energy. And while she is lying down, the claws can be trimmed. Because it is precisely the sole ulcers that started this whole mess. Because of her painful hooves, the animal spent too little time at the feeding trough and did not eat enough. 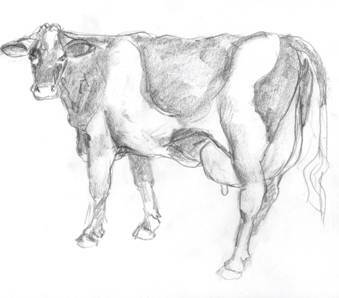 Then, it only takes a few days for a dairy cow that supplies plentiful milk to develop acetonaemia. The cow got its appetite back and her milk production was soon up to standard. It was not necessary to draw cash from the fund this time. And so a good nose is sometimes a very valuable thing. In this case: the price of a dairy cow.